The season for major blockbuster video game releases is fast approaching. You can tell, because here's news of the final Call of Duty DLC pack for the year. 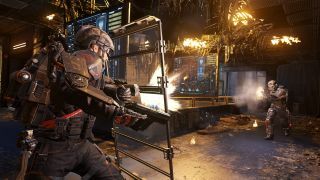 To neatly tie off Call of Duty: Advanced Warfare before Black Ops 3 arrives, the Reckoning DLC pack will release some time "soon" with four new maps. That's the trailer above. All maps are built around the Exo Grapple mechanic, though if you'd prefer not to play in matches with that feature you still can. Meanwhile, the final chapter in the "Exo Zombies saga" will feature in the form of Descent, which stars the likes of Bill Paxton, Rose McGowan, John Malkovich and Bruce Campbell. Details on the four multiplayer player maps are below. Reckoning releases next month for Xbox (due to a timed exclusivity agreement) but it'll be out on PC some time after.